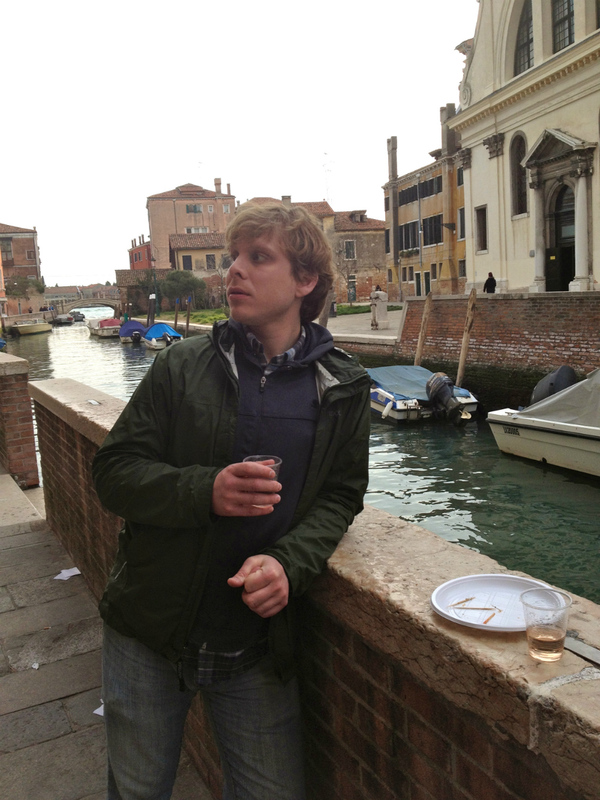 I’ve actually been to Venice three times now, but my favorite trip was my latest, with Andrew on our 2015 trip that started in Munich. We drove from Garmisch-Partenkirchen to Venice, which took about five hours—on the longer end of what I’d recommend for a mid-trip drive, but totally worth it. As there are no cars allowed in Venice, we parked ours in one of the large garages at Piazzale Roma and took the public ferry into the heart of Venice. I had actually stayed at our hotel, Casa Rezzonico, when I visited Venice with my family a few years ago. The location is really perfect. 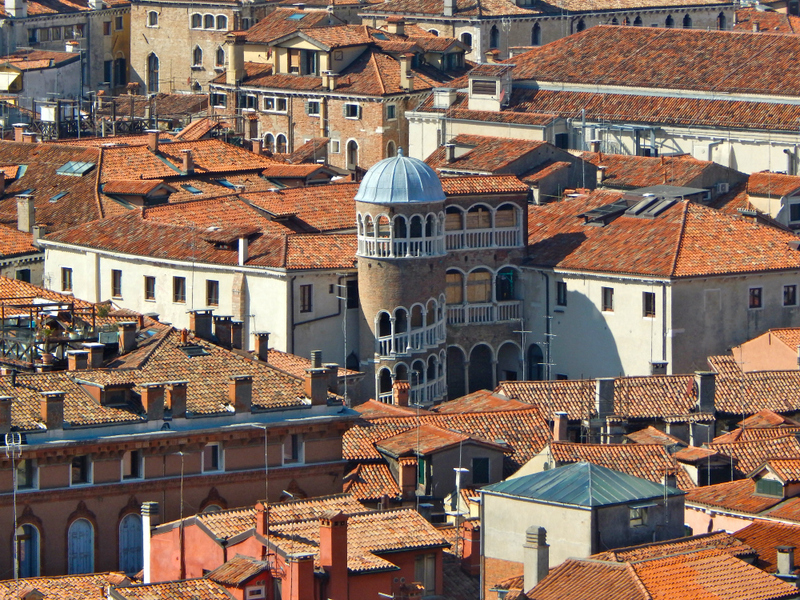 It’s in a quiet area of the city called Dorsoduro, a little bit away from the crowds of Saint Mark’s, but still an easy walk to all the major sights. The inn is small, with about a dozen rooms, but they are very spacious and affordable—lodging in Venice can be astronomically expensive, so a nice mid-range place like this is hard to come by. 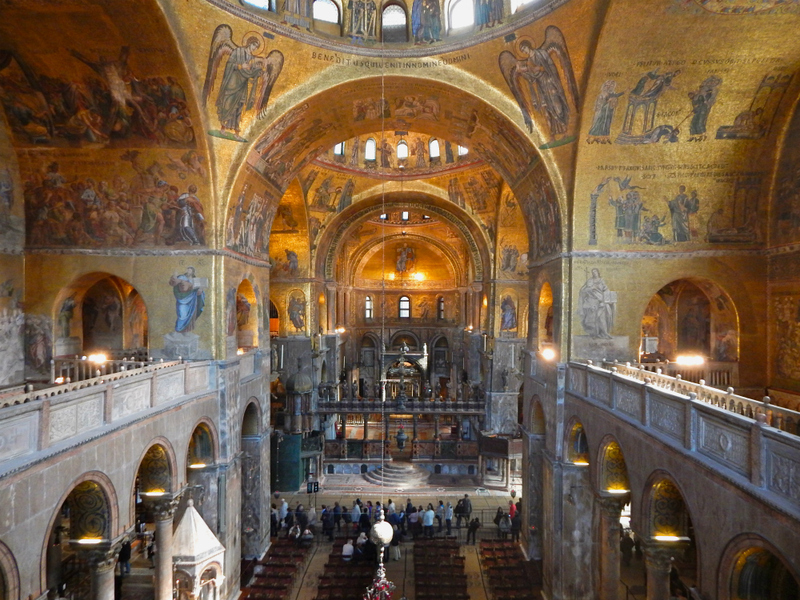 We visited in March, which proved to be a great time to visit Venice as there are far fewer tourists than usual. The weather was perfectly fine for sightseeing with a light jacket, and I was able to visit a few sights that I had previously skipped due to the crowds. 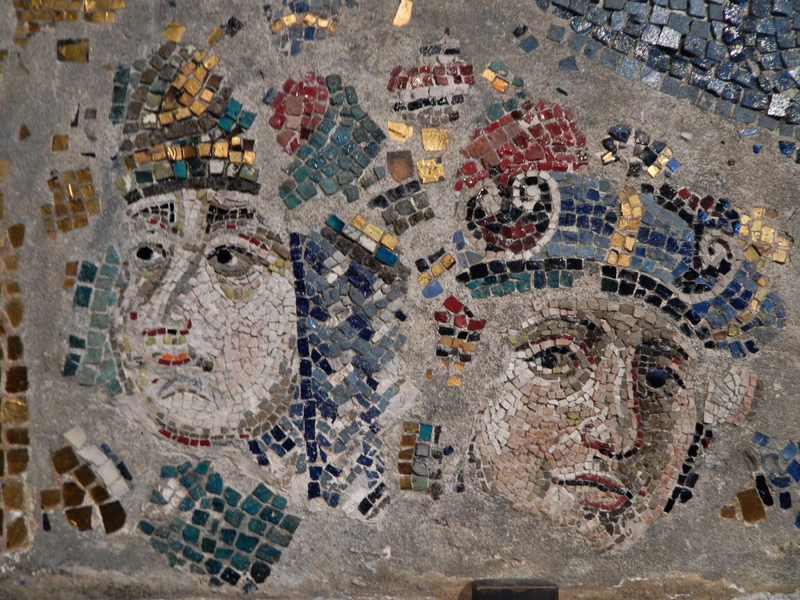 We went into Saint Mark’s and saw the beautiful mosaic and tile work (and took a few illegal pictures inside). 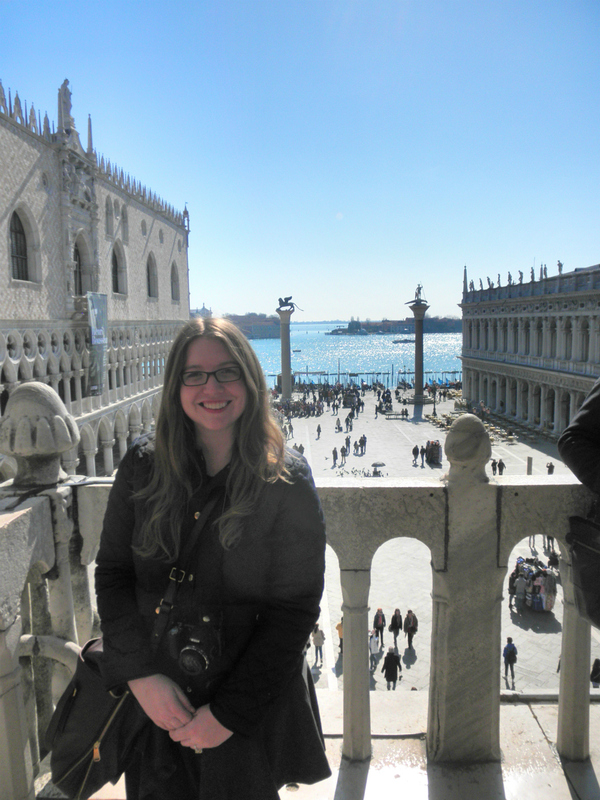 The view from the gallery is also gorgeous, looking out on the Piazza San Marco and the Campanile. 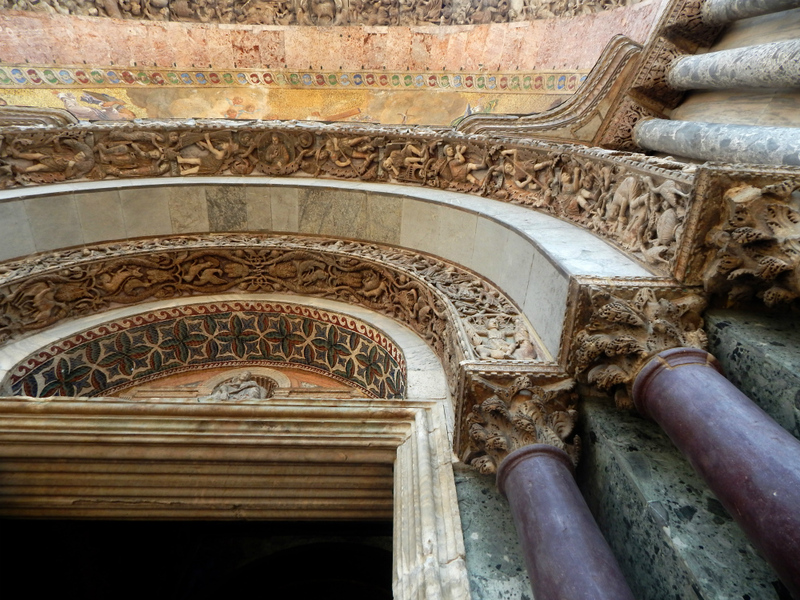 Afterwards, we went to the top of the Campanile (Andrew was disappointed there was no option to take the stairs—everyone goes up by elevator). 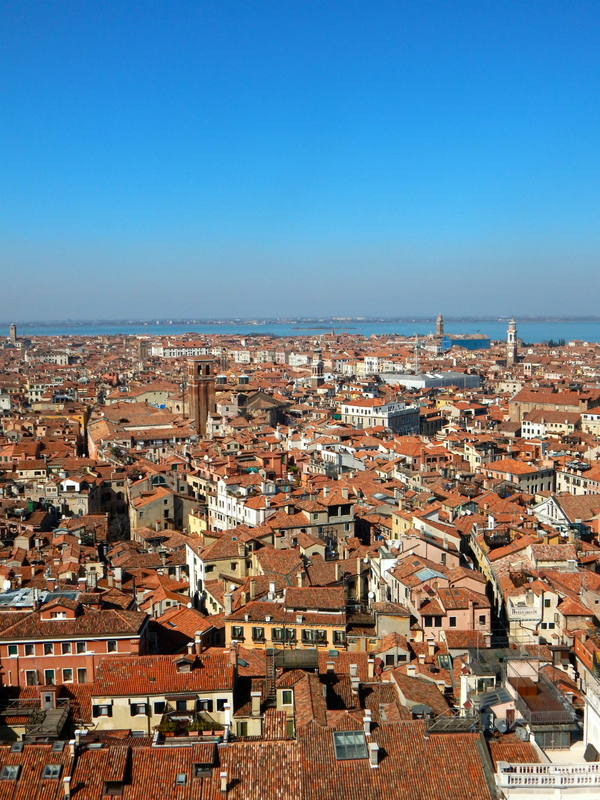 The views of Venice are breathtaking and I was able to take a few cool super-zoom shots with my new camera. 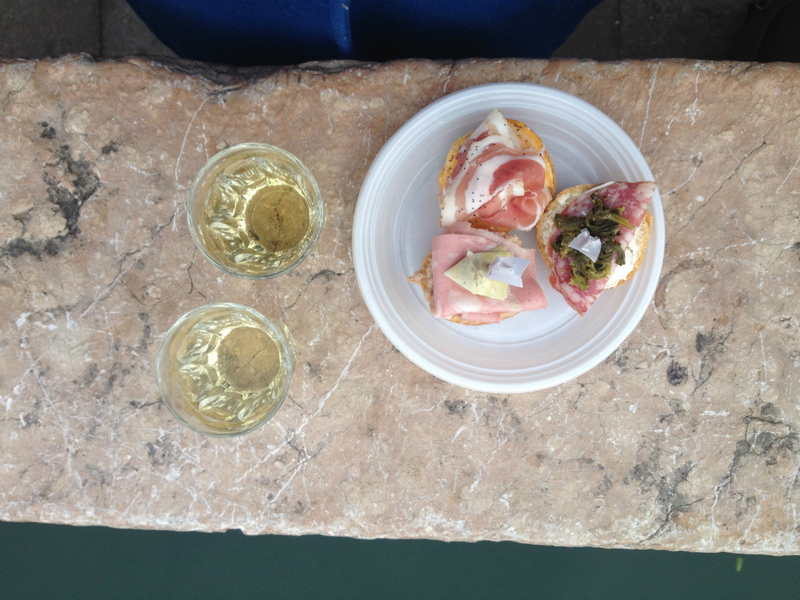 Our favorite thing to do in Venice was eat ciccheti. 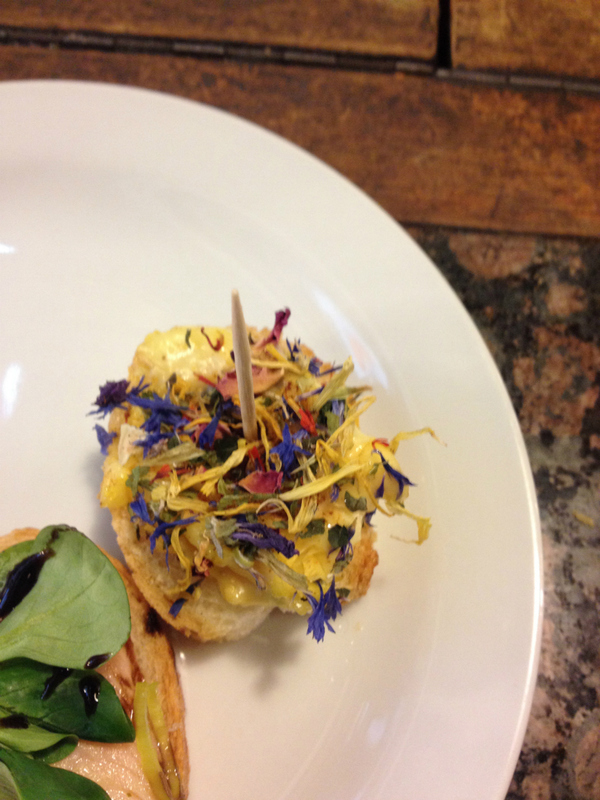 Similar in concept to tapas, ciccheti are small bites usually served on crostini. Each ciccheti costs only one or two euros, and you can order a small glass of wine (a “Venetian pour,” as we called it) with it for the same amount. I had a few places mapped out to try, like an osteria near our hotel that was featured in the New York Times, known as either Cantinone gia Schiavi or Vini al Bottegon. 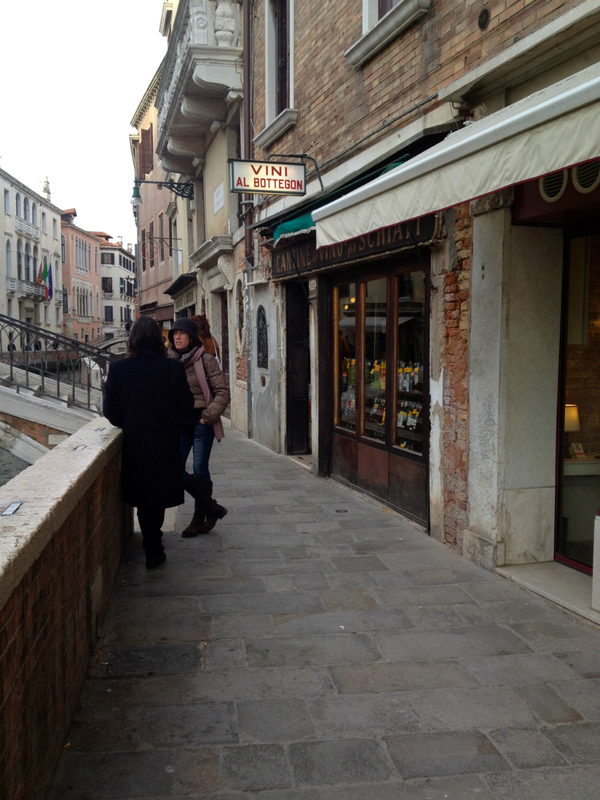 This turned out to be our favorite spot, and we enjoyed our ciccheti right outside by the canal. You can easily go on a ciccheti bar crawl like we did—just look out for places wit “osteria” in the name and dart in to see if the ciccheti are on display at the bar. During our stay, Andrew enjoyed spotting different types of boats, such as the police boat, the DHL boat, and a gondola traffic jam. We also took the public ferry the length of the Grand Canal to see Venice from the water. I recommend this rather than taking a gondola ride. Taking a gondola is the equivalent of taking a horse and carriage ride in Central Park. It’s touristy and very, very overpriced. 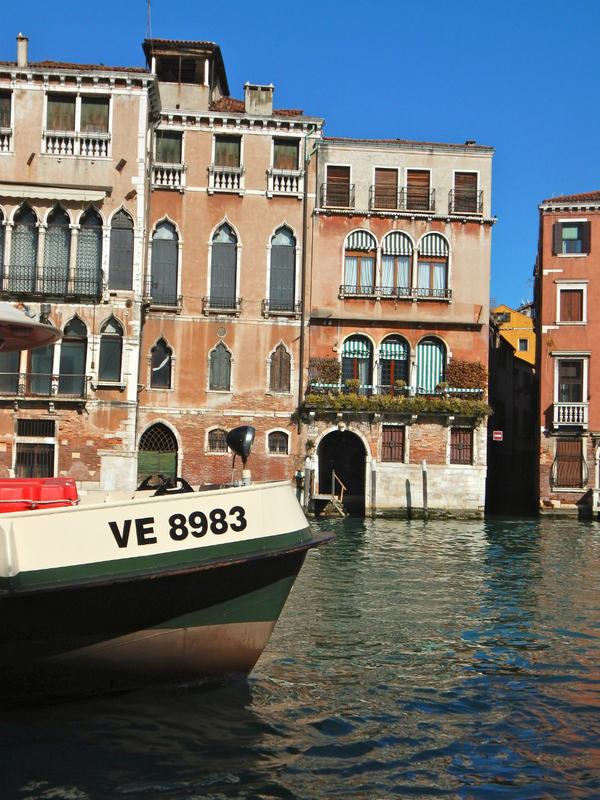 You will have to negotiate a price with your gondolier before you begin, and the baseline rate is 80-100 euro for a 40 minute ride for a party of four—but many gondoliers will ask for more or try to give you a shorter ride. The public ferry will cost you 7 euros, or 20 for an all-day pass, and you can see the entire city from the water. The best way to see the nooks and crannies of Venice is to walk down its alleyways and over its little bridges, but it is nice to see it from the water as well, and the public ferry is the way to go there, in my opinion. During our stay, we learned that many of the buildings on the Grand Canal are abandoned because of the extremely high cost of maintaining them. Though the city on the water is incredibly romantic, the reality of all that water is very damaging to buildings are requires constant upkeep. Venice rests in a state of beautiful decay, but I truly wonder if it can last.